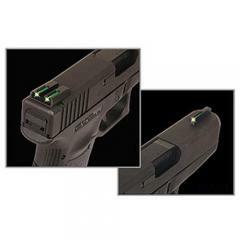 TruGlo Brite Site TFO (Tritium and Fiber Optic) Sights FREE SHIPPING! Shoot in the daytime, nighttime or any time in between using the Brite Sight TFO (Tritium and Fiber Optic) Sights from TruGlo. The engineers at TruGlo have combined the long lasting brightness of tritium lighting with the visibility of fiber optics to produce a versatile sight that seamlessly transitions between high and no light environments. Fiber optic technology naturally utilizes all available light for crystal clear visibility, combine this with the non-electrical glow of tritium and the result is a lightweight and always-visible sight. Engineered to fit the needs of tactical firearm users, these sights feature concealed fibers that prevent detection. A snag-resistant design allows for a secure fit in standard holsters that will not hinder draws. Amazing Product, Works great and i wouldn't buy any other sights. ©2002-2019 CopsPlus.com: TruGlo Brite Site TFO (Tritium and Fiber Optic) Sights FREE SHIPPING!